If you think of The Beach Boys, what comes to mind? Surf, sun, girls, and cars? Beautiful harmonies and Southern California? If you’re a fan, you might think of the creative genius of Brian Wilson, the group’s undisputed leader. 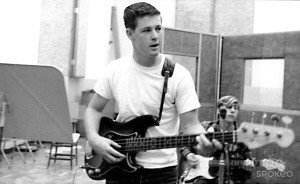 Brian Wilson in the mid-60s. What happened to Wilson, a sensitive soul with an ear for gorgeous music, is one of the saddest, weirdest, and — ultimately — most inspiring tales in music history. Brian Wilson in the early 70s. Join us as we tell the tale of Brian Wilson and his therapist — a terrible human being named Eugene Landy. 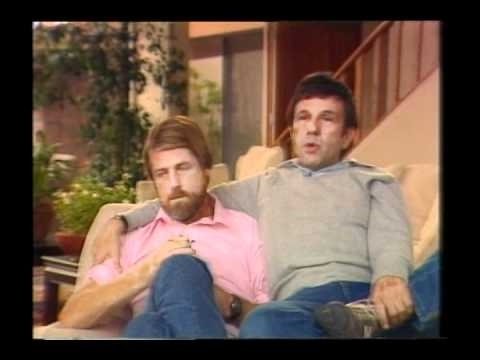 Wilson and Eugene Landy in the 1980s. We’ll get into everything: from abusive fathers to massive cocaine abuse, from 3 part harmonies to faked autobiographies — we’ll cover it all. I love your podcast, but one thing really bothers me – so one of you is telling the actual story, factual and interesting. The other is basically there to.. what? joke, interrupt, state the obvious (which is annoying in and of itself)? If yes, please stop for a moment to let the joke sink and have fun with it. Otherwise, it is EXHAUSTING for the listener when you speak over each other, but not WITH each other. Other than that – keep on the good work! I am totally in agreement with Dod’s comment. I just finished listening to this episode (my first Liar City), and though I enjoyed it, I was very distracted by Brian’s lack of interest in anything Darien had to offer, when he could even get a word in edgewise. It was pretty annoying. I kept feeling bad for Darien, afraid for him to open his mouth because Brian would barely acknowledge his comment, or just ignore it altogether and continue plowing through the story. Either just have one host, or have two who have enough respect for each other that they are actually having a conversation. But you have great content, so just work out the rapport, please! Thanks. YES to Dod and Steph! I love this podcast. It was recommended to me and I’ve been hooked ever since, and it’s my #1 recommendation when anyone else asks me for any good new podcasts. But the format isn’t quite at top level yet. A dialogue would be great. A monologue would be weird. It’s in between right now. Keep up the great work, can’t wait for more episodes, be safe from raccoons! My only knowledge of the Beach Boys were surf, cars and girls songs: I Get Around, Barbara Ann, Fun, Fun, Fun, and the like. And watching them wearing stripe shirts when performing. That was my world of the Beach Boys although the knowledge was extremely vague. I grew up in the 1960s, so I was too young to remember the Beach Boys in a keen sense. Perhaps because they were overshadowed by the Beatle at that time. Although I listened and like the Beach Boys and heard their songs, I really knew little about the group, their careers, their album, their struggles until I became a devoted fan. Pet Sounds didn’t do well at the beginning because people were not used to it. They were used to surf songs and the stripe shirts. But Pet Sounds grew on fans as time went on. Hi, I’m a podcast critic and I have tons of useful, insightful, and most importantly free advice that all comes from—you guessed it—my unique and often under valued opinion. My opinions are, of course, meant to be constructive but mostly exist for me to feel like I have a real platform for my obviously sought after voice and wisdom. You know what? On second thought, how about I just thank you and applaud you for creating something and then giving it to me for absolutely free? Yeah, that! I’ll do that. You’re the best! Thank you. I’m going to go back to my stupid spread sheet and cold calls. My life is great. There was an interesting time period for Brian (1979-1983) from the divorce of Marilyn to the time when Brian was reinstated with Eugene Landy. I’m surprised there were no mention or discussion here.